The International Music Summit has announced the first speakers for the debut edition of its IMS College — Malta, a special electronic music college, focused on teaching and inspiring the next generation of dance music professionals. To tutor and mentor dance music’s future stars, IMS, along with partners Point Blank Music School and SAE Institute, has invited 14 speakers occupying different key roles in the industry, led by BBC Radio 1’s most recognizable voice, Pete Tong, who’ll share his knowledge about DJing and radio. 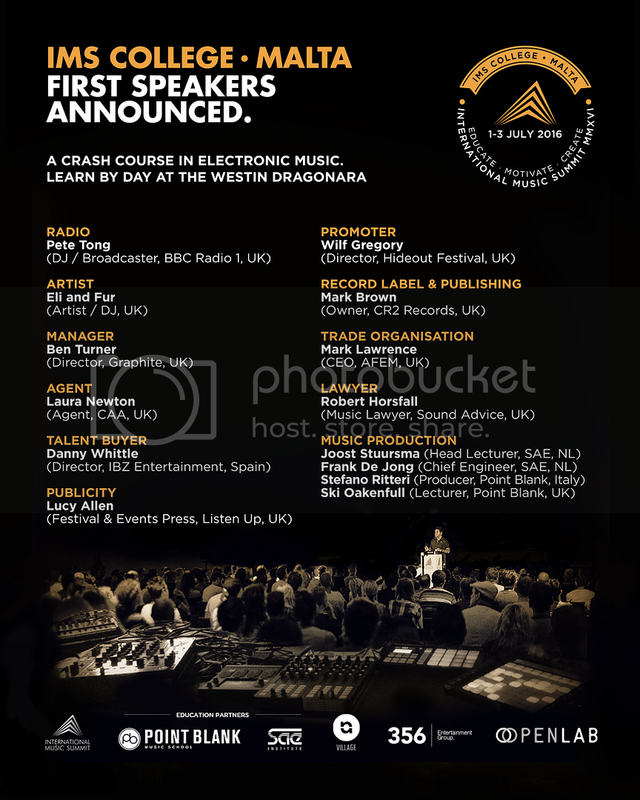 The list of the first speakers confirmed also includes IMS co-founder Ben Turner, who’ll shed some light on artist management, and artists Eli & Fur, Red Bull Studios Chief Engineer Frank De Jong, producer Stefano Ritteri, EMC Head Lecturer Joost Stuursma, Hideout Festival director Wilf Gregory, Point Blank lecturer Ski Oakenfull and more. To check out all the names confirmed so far, check out the flyer below. IMS College — Malta will be held from July 1st to 3rd in Malta. For more info, head to the event’s website.